All sales are final. Please download and try our software products before you purchase them. 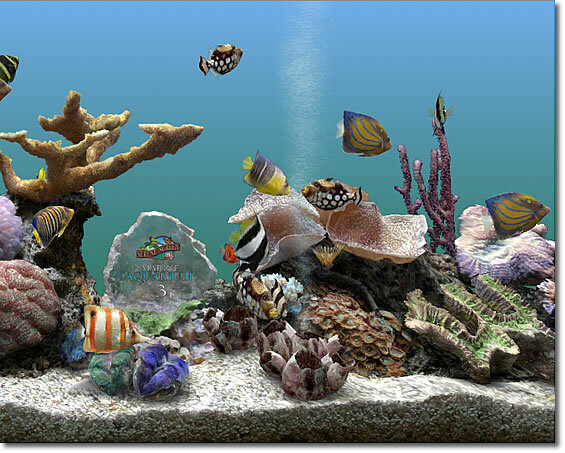 After years of development, SereneScreen Marine Aquarium 3 is finally available for download and purchase! Marine Aquarium 3 is not just an update to previous versions - the entire program has been re-written from the ground up as a full High Definition 3D environment, taking advantage of the increased capabilities of modern video cards. An incredible new high-definition 3D tank, bringing a whole new definition to 3D aquarium simulations. No more 8-fish limit. The larger tank can handle up to 30 fish at once! Multi-monitor support. Mirror your aquarium on two or more screens! Music play-list. Choose your own MP3 or other music files to play in the background as you watch the Aquarium! Clock/Calendar. Keep track of the time and date while enjoying the fish. Custom Logo support. Add your custom logo to the crystal in the tank! Automatic lights. There will soon be a greatly expanded interface for customizing the background colors. New realistic fish behavior, including schooling, chasing, and pecking at corals. Once these features are in place, the stage will be set for many exciting additions. Optional Creature Packs will utilize the large environment as a playground for a wide array of different fish and invertabrates. If you want to join the fun and participate as this exciting program matures, you may purchase an MA3 Key Code, or upgrade your Key from MA2.6 to MA3. You are also welcome to go to the Fan Forum and give your thoughts and suggestions. Download Link Download now and try for FREE!!! A new high resolution background gives your fish a place to play.